The first rains after a long period of drought this summer washed so much fertiliser into the surface water, including the swimming water, that cyanobacteria made the water unusable and dangerous. Researchers from Wageningen University & Research, the Netherlands Institute of Ecology (NIOO) and Brazilian universities have shown in the journal Frontiers in Microbiology how a pulse of fertiliser causes an explosion of cyanobacteria populations. After months of drought and an increasing deterioration of the water quality due to cyanobacteria, rainfall on 9 August finally brought some relief. However, the rainfall also washed fertiliser into the surface water. In research that they have been conducting since 2010, the researchers investigated the effects of this scenario. 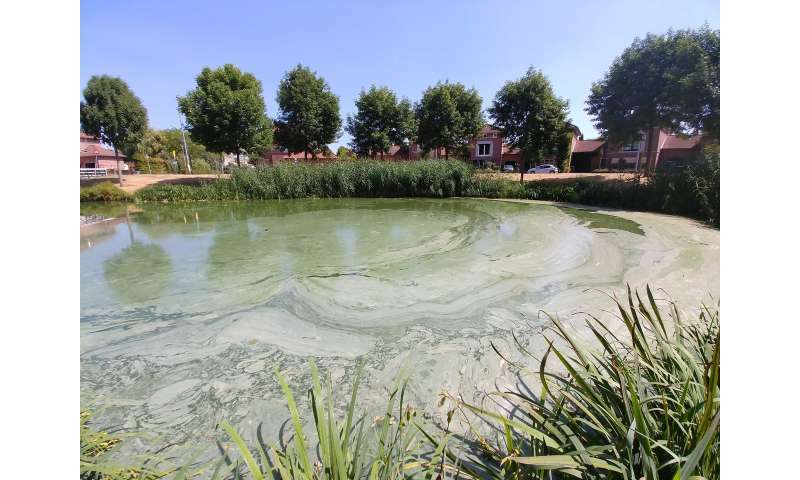 They took samples of 39 different waterbodies in and around towns and cities, predominantly in the province of Noord-Brabant. They took two samples from each location every time. In the laboratory they enriched one of the water samples with fertilisers and left the other sample as was, and then set both aside at normal or higher temperatures. "Whether the water was 20 degrees or 25 degrees didn't really make a difference," says research director Miquel Lurling. "But at both temperatures the addition of nutrients caused an explosion in the cyanobacteria already present." The research also showed that in water that initially contained less fertiliser, there was no explosion of cyanobacteria. According to Lurling, "This is a very important indication for drastically reducing the fertiliser content of surface water. The buffering capacity of ponds and lakes will then increase, allowing them to withstand the negative aspects of climate change such as periods of drought that are alternated with downpours. There are various techniques to make surface water more resistant to algal blooms, such as the maintenance and immobilising of fertilisers." Cyanobacteria, which are also called blue-green algae, grow in warm, fresh water that contains plenty of nutrients. An algal bloom occurs when there are so many cyanobacteria in the water that the surface turns a greenish-blue colour. Many species of cyanobacteria produce toxins that can cause health problems if you come into contact with them or swallow them. What is causing Florida's algae crisis?